Thunderbolt™ 3 cable boasts its capacity to transmit large data at 40Gbps speed, produce a 4K video output (gives you an ULTRA HD video resolution) and make daisy chaining possible- where you can connect to not more than 6 devices. 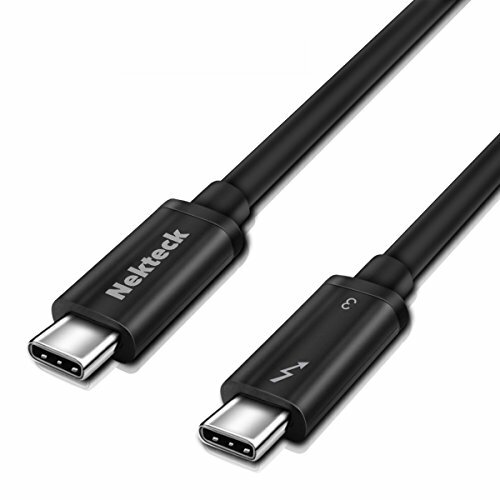 Nekteck's Thunderbolt™ passive cable ensures that it will deliver the full and enriching features of Thunderbolt™ 3 USB. Considered as one of the finest cables to use for charging, transmitting data and connecting Thunderbolt devices or even other peripherals with the use of the appropriate adapter. THUNDERBOLT™ CERTIFIED: Nekteck Thunderbolt™ 3 passive cable has acquired the Intel's Thunderbolt™ qualification standard. It went through quality checks to ensure durability, reliability and safety. It's safe and ensures consistent performance with your Thunderbolt™ enabled device. LIMITLESS FUNCTIONALITY: Compatible with all Thunderbolt™ 3 & USB C gadget like Ethernet adapter, USB hub, Docking Station, eGPU, PCI-E, etc. It is backward compatible with older Thunderbolt versions as well as USB TYPE A, Micro USB with the use of the right adapter. Tough power delivery of up to 100 Watts which makes Thunderbolt™ 3 charging capacity - exceptional!